This fall we're teaming up with Domaine Serene to offer a unique opportunity to purchase one of our custom, handcrafted VV Series wine cellars fully stocked with 35 curated cases of award-winning and rare Domaine Serene, Maison Evenstad, Château de la Crée and Les Tourelles de la Crée wines that will quickly become the centerpiece of your wine collection. 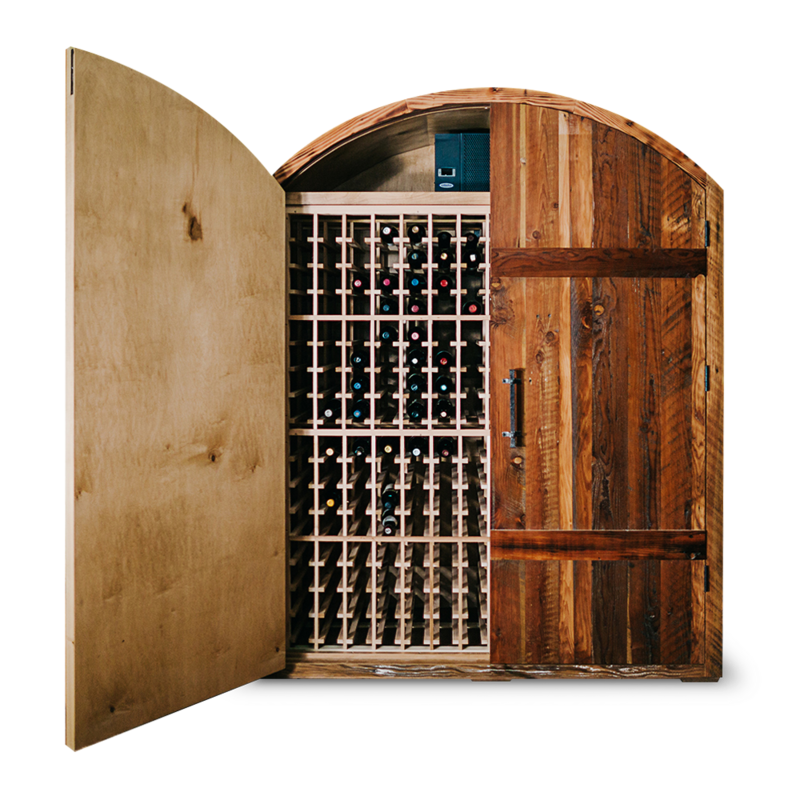 Your fully customized luxury wine cellar will be built with meticulous craftsmanship and attention to detail — down to the hand-forged iron handles and hardware finishes. Store and protect up to 448 bottles with an intuitive and easy-to-use universal racking system and top of the line cooling technology. * Wine, shipping & customization included in price. Wine supplies are limited. A robust and structured Pinot Noir from the Willamette Valley, carefully hand-selected from the finest barrels and made in extremely small volumes. A sophisticated blend of mineral, acid and tart fruits, this luscious and silky Pinot Noir is drinking well today and will age beautifully over the next 10 years. A beautiful, structured Pinot with notes of ripe blackberry, black cherry and chocolate. Meyer lemon, pink grapefruit and butterscotch come together in this intense, layered Chardonnay. Appreciate it now or cellar it for added complexity. A serious wine for the serious collector, this extremely rare blend was created to showcase the complimentary styles of the Evenstad Estate’s East, South and West exposures. A beautifully rich Premier Cru Burgundian Pinot Noir with notes of plum and spice. An impeccably balanced Pinot with ripe, polished tannins, bold red fruit, barrel toast and spices. A dense opening with hints of smoke, char, espresso, cacao, and a dash of sea salt segues into red currant and black cherry. Domaine Serene’s highest-elevation Pinot Noir vineyard is slow to ripen, allowing for full flavor development and highly complex fruit with excellent aging potential. A lush wine that mixes barrel spice notes with dark fruit. A long, textured finish worth lingering over now through 2025. A unique wine with a brilliant pale yellow hue and a focused palete with an essence of fresh ginger and Meyer lemon. Most Domaine Serene single-vineyard wines are grown right on the Dundee Hills estate; this one reflects a different home, in the Eola Hills AVA. A densely layered wine with red and black fruit, plum, cherry, tobacco and black tea notes. This wine shows excellent weight and freshness, with lovely notes of exotic fruits and apricot on the palate. The nose is very expressive, with notes of citrus and exotic fruits, fern, hazelnut and butter. The Beauregard vineyard is one of those hidden gems that reveal Santenay’s potential for magical white wines that offer a perfect equilibrium of body, elegance and mineral-rich complexity. The best characteristics of two very different varietals, Syrah from the Walla Walla Valley, and Pinot Noir grapes from the Dundee Hills. Inviting aromas of bright citrus, vanilla and crème brûlée with luscious minerality and salinity through the finish. Domaine Serene's defining standard by which all of their Pinot Noirs are measured. The best barrels are hand selected each year for this flagship wine. The 2016 vintage from this high-elevation vineyard shows excellent aging potential with crème brûlée, Meyer lemon zest and hints of marzipan. There may be no other region in the Côte de Beaune as synonymous with world-class Chardonnay as Meursault. Stunning and charming on the nose, with soft minerality present on the palate and a long, persistent finish. Electric on the approach with intense citrus aromas of lemon zest and white flowers. On the palate, the wine displays a vibrant acidity, yet feels rich and round with a gentle note of honey on the finish. A dynamic and dense Pinot Noir with silky, structured tannins, a melange of red and black fruits in the mouth, and a fresh clean finish. Cellar for at least five to eight years. This is Oregon chardonnay at its finest. Bursting with gorgeous aromas of fresh cut pineapple, guava and melon. Fresh flavors of green apple and citrus are the hallmarks of this elegant, handsomely opulent white Burgundy. On the palate, the wine’s beautiful fruit profile is complemented by a subtle mineral acidity. Dark ruby in color, the Yamhill Cuvée is extremely expressive showcasing heavenly aromas of cocoa, pomegranate, clove and star anise. Polished and plush, its seamlessly integrated and inviting tannins lead to a long, lingering finish. Clean, pure expressions of Burgundian terroir, ideal for everyday drinking, this fresh and youthful Chardonnay reveals aromas of honeysuckle, white peach and hazelnuts. A delicate Rosé artfully blended to achieve a graceful balance of freshness and depth of flavor along with an array of exotic fruit characters.